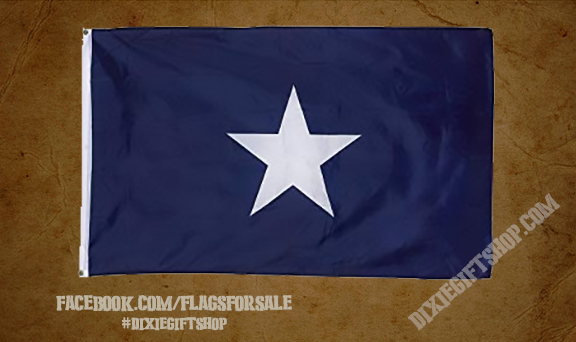 The Bonnie Blue Flag was the first, unofficial, flag of the Confederate States of America as it flew over the batteries firing on Fort Sumter to begin the Civil War. It also flew over the capitol in Mississippi in January of 1861 when that state voted to leave the Union. The design for the flag was used in 1810 by the Republic of West Florida when they rebelled against the Spanish before the area was annexed by the United States with the Louisiana Purchase. It was used again in 1836 by the Republic of Texas during their rebellion, though with a golden star. The Bonnie Blue can typically be seen flying all over the Southern states, as well as historic spots such as the Jefferson Davis Monument in Kentucky where the CSA President was born.